This Fall, try this fun way to dress up a boxed cake mix! 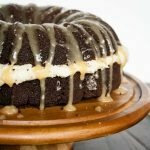 Pumpkin Cake with Salted Caramel Glaze is a scrumptious flavor combination. 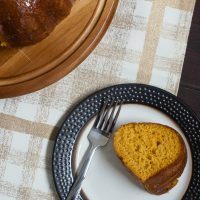 The simple pumpkin bundt cake is made using a boxed cake mix and a few extras to make it special. Next comes a sweet caramel glaze, all topped with sea salt! This cake was inspired by an extra special Starbucks drink. I have always loved their Pumpkin Spice Latte. Years ago I was getting coffee with a friend when she asked for a PSL with a drizzle of caramel and sea salt. Mind blown! Ever since, it’s how I’ve been ordering my PSL. It also turned into this gorgeous cake! 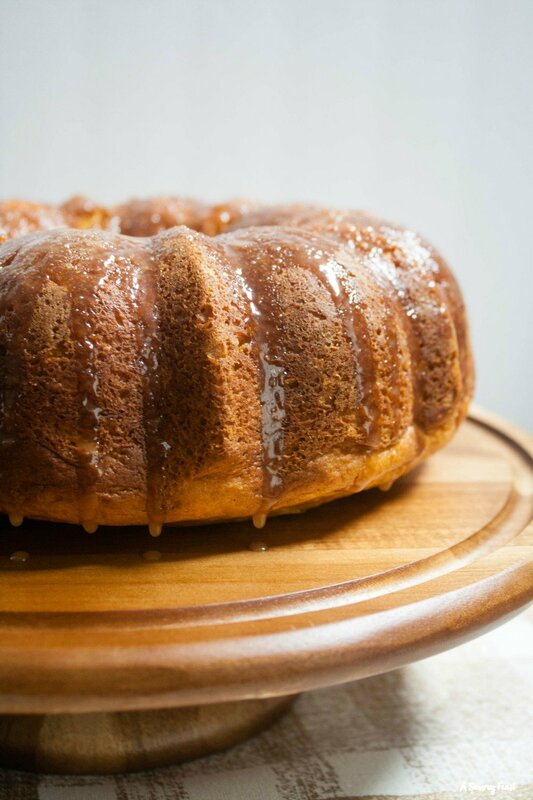 This dessert is a simple pumpkin cake topped with a homemade caramel glaze and sprinkled with sea salt. If one dessert can represent Fall, this is it! Pumpkin and caramel go so well together, and the sea salt takes it to the next level. What are some of the ways you are kicking off the Fall season? 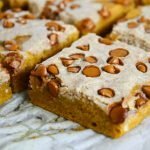 I’m probably a little too obsessed with pumpkin, but I know I’m not alone in that! This recipe was originally posted on A Savory Feast on September 25, 2014. The pictures and text have been updated but the recipe is the same. Pin the image below to save this recipe for later! Preheat oven to 350. Grease and flour a bundt pan. In a medium bowl, combine the cake and pudding mixes. Add in the eggs, pumpkin, butter, buttermilk and pumpkin pie spice. Mix well. Pour the dough into the bundt pan. Bake for 35-45 minutes. Cool in the pan for 15 minutes, remove from pan and place on a wire rack. Cool completely. Stir cream, brown sugar and corn syrup in a saucepan on medium high. Bring to a boil. Stir until the glaze begins to thicken and remove from the heat. Stir in vanilla and pinch of salt. Stir with a wooden spoon until thickened and cooled slightly. If it's still really runny, add more brown sugar, bring to a boil, and cool again. 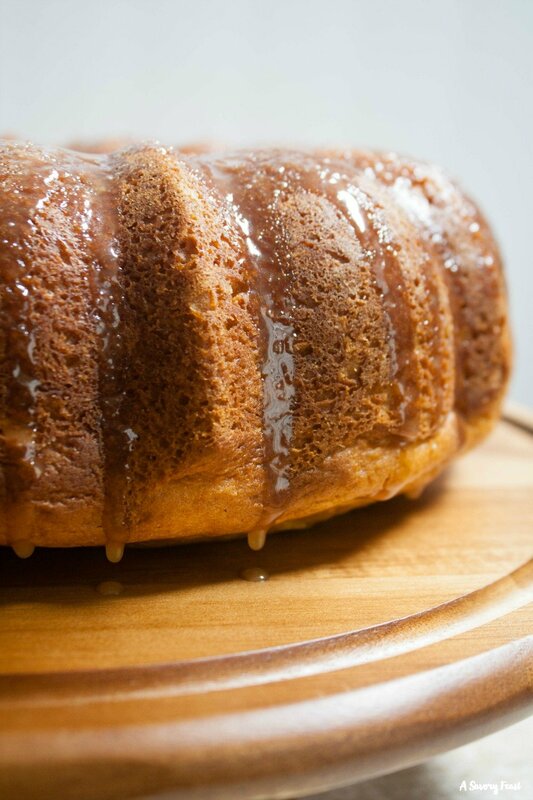 Pour the caramel glaze over the cake. Sprinkle with sea salt. It turned out so good! You will definitely impress everyone at your next get together. I wish I could have a bloggers get together and bake some tasty treats! That would be amazing and I would totally do that just to gain some baking insight! I hope to make one someday! This is probably one of my favorite things I’ve ever made! You will love it. Wow. Yup. Making this today, I’m stopping at the market on the way home. Your photos are so great Jenna, everything always looks so phenomenal!! I can’t wait to hear what you think! You should share a picture. This looks like the perfect cake to have with a latte on a cold autumn evening. Looks delicious! Thanks for sharing the recipe. It would be great with a latte! I am planning to bake it again today so I will have to try that. Yum! This sounds and looks so delicious! I have never seen anything like this! Not a bread but a cake, and I love the salty aspect! It turned out even better than I had hoped! You should try it. What a great idea! I didn’t know TJ’s had a pumpkin muffin mix. I will need to try it! What a yummy cake! Thanks for sharing. I love pumpkin, and this looks so easy too. Thanks! It was very easy, but looks impressive. Enjoy! Thank you! I’m sorry that we weren’t able to offer this giveaway to anywhere outside the U.S. It’s a pretty big package so it gets too expensive! I totally agree sea salt takes desserts to the next level! It does! My pinterest dessert board has sooooo many sea salt ideas. I’m welcoming it with wearing sweatpants, hahaha. Seriously- SO happy it’s finally cooling off! Also I’ve had a pumpkin candle lit all day! I’ve been meaning to pick up a pumpkin candle. Hopefully the cooler weather will make its way down to Florida soon. Wow! This looks incredible! 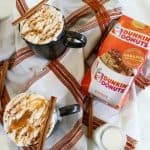 Adding salted caramel to anything pumpkin sounds delicious! Oh yes! I am obsessed with salted caramel anything. 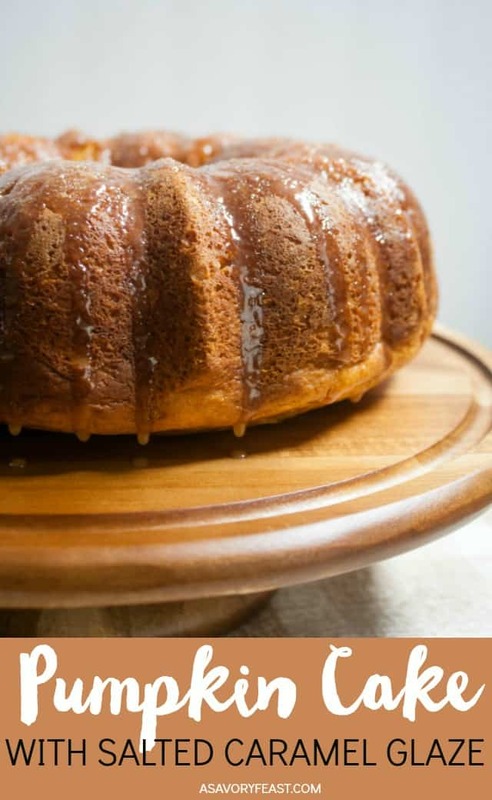 Pumpkin cake and caramel…. what an utterly perfect pairing. Two of my personal favs… love how you got inspiration, and how you created your own version (which I bet is far better!). Thank you for a lovely, decadent-sounding recipe – I want to make this immediately! Thank you for your kind words! I hope you get a chance to try it. Caramel goes so well with pumpkin! You will love this. This sounds so good! I might try to make it for Thanksgiving. I was thinking it would be good for Thanksgiving! I’m sure it will be a hit. What an amazingly delicious recipe! And cool link-up! Thanks! I’ve made this cake twice now and it is crazy good. 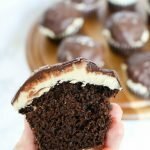 Looks delicious and so easy using box mixes! Love shortcuts! Don’t you love that? I love recipes that can dress up a cake mix. I’ve been trying lots of new pumpkin recipes this Fall. I have found some winners, like this cake! That’s because it’s so good! 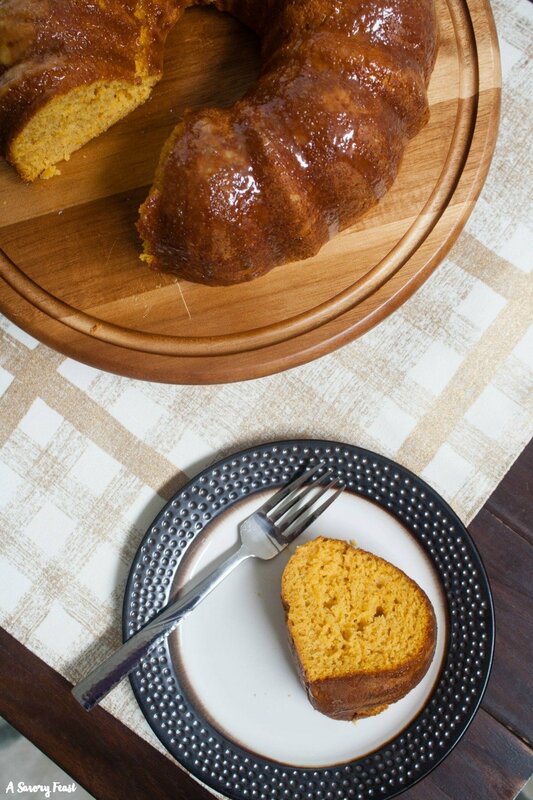 It goes really well with pumpkin in this recipe. Not at all! I can’t wait to see it. oh my goodness that looks amazing! I’ve already made it twice! I can’t wait to make it again. Maybe Thanksgiving? 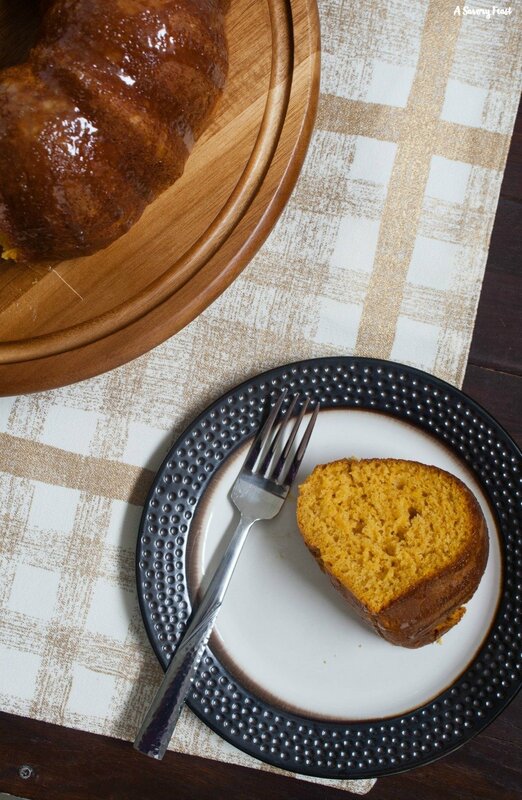 Your Pumpkin Cake with Salted Caramel Glaze looks delicious. This is a fantastic recipe and thanks so much for sharing it with us. Hope to see you again real soon at Full Plate Thursday! Thank you, Miz Helen! I always appreciate how you visit and comment on my post each week! Made this yesterday and it just may be the best cake I’ve ever had! Yay, I’m glad to hear you tried it! If you took a picture you should share it with me on social media. I would love to see how it turned out!